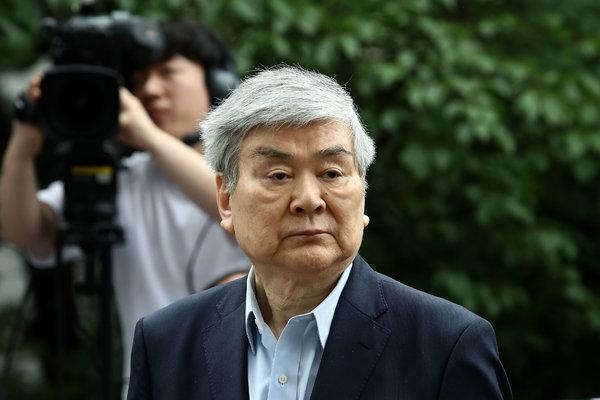 Cho Yang-ho, whose 27 years as president of Korean Air brought substantial growth to the carrier but also a dizzying series of scandals, including two corruption investigations involving him and a notorious tantrum on a flight by one of his daughters, died on Sunday in Los Angeles. He was 70. The company announced his death on Twitter. Reuters said he had been undergoing treatment for an unspecified lung disease. Shareholders had ousted Mr. Cho from the company’s board less than two weeks ago, a highly unusual move in South Korea, where family-controlled conglomerates, called chaebols, like that run by the Chos, have tended to operate with a certain arrogance. Mr. Cho had been president of Korean Air since 1992, chairman since 1999 and chairman of the overarching entity, Hanjin Group, since 2003. He was indicted last year on embezzlement charges. He had also been indicted on a number of charges in 1999 and ultimately convicted of tax evasion. More recently Mr. Cho gained notoriety through the highhanded actions of his family members. In 2014, his oldest daughter, Cho Hyun-ah, traveling first-class on a plane that was about to depart New York, flew into a rage after a senior flight attendant served her macadamia nuts still in the bag rather than in a dish. Ms. Cho, who was a Korean Air vice president and its head of in-flight services at the time, ordered the plane to return to the gate at Kennedy International Airport so that the attendant could be removed. Social media exploded, quickly labeling it a case of “nut rage,” and critics of the chaebol system cited the incident as representative of the imperiousness of South Korea’s moneyed class. Ms. Cho was sentenced to a year in prison for violating aviation law, but was released early when an appeals court suspended the sentence. Another daughter, Cho Hyun-min, drew publicity last year when it was reported that she had thrown a cup of water at an advertising executive during a tirade at a business meeting. “I apologize with my head down for my foolish and reckless behavior,” she wrote on her Facebook page after South Korean news media reported the episode. Mr. Cho’s wife, Lee Myung-hee, has been accused of physically and verbally abusing employees. Despite the recurrent scandals, Mr. Cho retained a measure of respect in some circles, not only for transforming the airline into a multimillion-dollar international operation, but also for his leadership in bringing the 2018 Winter Olympics to South Korea. He led the organizing committee that secured the Olympic bid in 2011. Cho Yang-ho was born on March 8, 1949, in Incheon, South Korea, a city bordering Seoul. His father, Cho Choong-hoon, had founded the business empire that became the Hanjin Group in 1945, starting with a single truck. In 1969, he was chosen by Park Chung-hee, the country’s president then, to privatize South Korea’s airline. By the time the elder Mr. Cho began turning control of the airline over to Cho Yang-ho, one of four sons, in the 1990s, it was on its way to becoming a major international carrier. Mr. Cho continued the expansion, opening routes to China and Russia, among other places. “We’re ready to fly anywhere Korean customers want,” Mr. Cho said in 2005, when the airline signed a contract to upgrade its fleet with five Airbus superjumbo jets. One of his promotional strategies was to award perks to prominent South Korean figures. In June 2005 he made much of giving free first-class flights for a decade to Hwang Woo-suk, a genetic researcher who claimed to have made breakthroughs in stem cell and cloning research. Many of Dr. Hwang’s findings were later called into question. When the airline celebrated its 50th anniversary this year, it cited its growth from a fleet of eight aircraft that Mr. Cho’s father had begun with to a fleet of 166 planes today. Mr. Cho is survived by his wife and daughters as well as a son, Cho Won-tae, who has been president of Korean Air since 2017.